The Flint toxic water crisis has struck panic in residents across the country—and many are wondering if their city is providing clean, safe drinking water. A few years ago I remember standing in front of my kitchen faucet in shock, watching as brown water trickled from the tap. Thankfully, the problem was fixed a day later, but I can’t say the same is happening for the good people of Flint, Michigan. Due to poor infrastructure and a lack of public funds, the residents of Flint are in crisis. Their water is contaminated with lead and so far over 500 people have come forward with health issues. This may have sounded off alarm bells in your community—and for good reason. If this can happen in Flint, isn’t it possible in your hometown as well? Many areas in the U.S. have safe drinking water. Some cities, like New York, have cleaner water than you might expect. That’s because the city has invested millions in its water supply infrastructure. But as an American, you know that you can’t always trust the government to do the right thing. Sometimes you have to go the extra mile to ensure your health and safety are protected. Thankfully, you can enhance the safety of your water quite easily, and you don’t have to rely on bottled water to do it. This might come as a surprise, but at least one quarter of bottled water is simply tap water! It’s not only a big rip-off, but it’s a pollutant, so avoid it when you can. The first thing to do is go online and find out where your tap water is coming from. The Environmental Protection Agency’s web site can let you know the safety and source of your water. You can also get third-party information (likely the best source) from the Environmental Working Group. If you notice your water has a slightly chlorinated taste, it’s nothing to worry about. It’s not dangerous. The taste can be expelled by pouring water into a pitcher and putting it in the refrigerator for about 30 minutes. You can filter your water by purchasing a filtration system that attaches to your tap or buying a water filter. 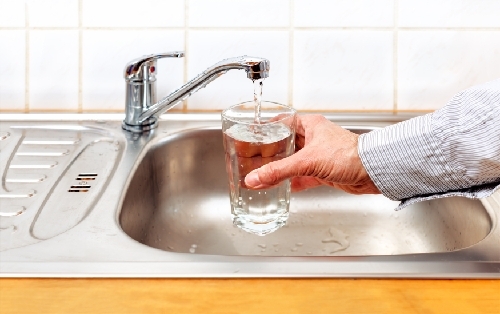 Installing a carbon filter under the sink is typically the most cost-effective way to get filtered water. The cost is about $50.00 and it only needs to be replaced a few times a year, depending on usage. Most of you will never need a filtration system, and I hope the disaster in Flint is an isolated incident. But to be on the safe side, keep track of your water and take action when necessary. Shaw, G., “What Are the Best Sources of Drinking Water?” Web MD web site; http://www.webmd.com/diet/best-sources-drinking-water?page=1, last accessed January 20, 2016. Botelho, G., et al., “Flint resident on water crisis: ‘We’ve lost public trust’,’” CNN web site, last updated January 20, 2016; http://www.cnn.com/2016/01/20/health/flint-water-crisis/index.html, last accessed January 20, 2016.